Have you heard the theory, “No peanuts before the age of one!” New studies are showing that is not the case any longer. We had the opportunity to meet Dr. Katie Marks-Cogan and speak with her about food allergies in children. What a privilege this was and we learned so much about the company Ready, Set, Food! Please read what Dr. Marks-Cogan has to say about her experience with food allergies. As a board-certified allergist, I’ve seen firsthand how families struggle with food allergies. Fortunately, recent landmark studies have shown that you can reduce your baby’s risk of developing common food allergies by feeding them allergenic foods early and consistently, starting between 4-11 months of age. But introducing babies to allergens can be challenging because many 4-11-month-olds are picky eaters. In fact, many infants aren’t developmentally ready for solid foods as early as 4 months of age. To help make early allergen introduction easier for busy families, I’ve compiled 6 tips for food allergy prevention, based on findings from the recent studies. Food allergies are on the rise, with 1 in 10 suffering from a food allergy today. But over half of children with food allergies have no family history. That’s why early, sustained allergen introduction is recommended for all babies, regardless of family history. (If your baby has severe eczema, consult your pediatrician before feeding your baby allergenic foods, to determine if an allergy screening is required first). Scientists believe that between 4-11 months of age, babies’ immune systems develop either a positive or negative response to food proteins. Consistently introducing allergenic foods during this critical window promotes a positive immune response to these foods, and helps reduce your baby’s risk for developing a food allergy. But delaying this allergen introduction may put your child at a greater risk for developing a food allergy, according to studies. So, start introducing allergens early, between 4-11 months of age. When you’re ready to introduce allergens, choose a time when your baby is healthy. Also, make sure that an adult can closely monitor your baby for at least 2 hours, to watch for any signs of a reaction. Feeding your baby allergenic foods only once or twice is not enough to help reduce their risk of developing a food allergy. Instead, your baby needs consistent exposure for their immune system to develop a positive response to these foods. In the landmark studies, infants consumed allergenic foods 2-7 times a week for 3-6+ months. (In fact, in the LEAP study, babies were exposed to allergens for 4 years.) Thus, make sure to feed your baby allergenic foods multiple times a week, for several months. Breastfeeding provides a wealth of benefits for your baby, but breastfeeding alone has not been conclusively proven to prevent food allergies. If you choose to breastfeed, you will also need to feed your baby allergenic foods early and often, to help reduce your baby’s risk of developing food allergies by up to 80%. As a mom, I know firsthand how challenging early, sustained allergen introduction can be. When my son David was 5 months old, I prepared an egg, peanut, and yogurt snacks for him to eat several times per week (peanut, egg, and milk comprise over 80% of all childhood food allergies). Unfortunately, this process was time-consuming and frustrating. Most of what I offered ended up either on my kitchen floor or on David’s bib. This difficult experience inspired me to find a solution that would make early and sustained allergen introduction easier for all families. 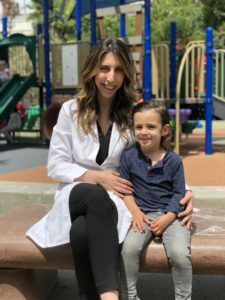 I worked with a team of physicians, leading allergy experts, and parents to create Ready, Set, Food!, an innovative system that can help reduce your baby’s risk of developing a food allergy by up to 80%. Follows the precise dosing used in landmark food allergy prevention studies. This eliminates the stress of guessing and preparing the right amounts of allergens for your baby. Starts with a low dose to maximize safety, and then increases over time to a higher dose to maximize effectiveness. Introduces one new food at a time, based on pediatric guidelines. Dissolves into breastmilk, formula, or your baby’s favorite puree, making allergen introduction easy, even if your baby isn’t yet ready for solid foods. Contains only organic, non-GMO peanut, egg, and milk – no added sugar or artificial additives. 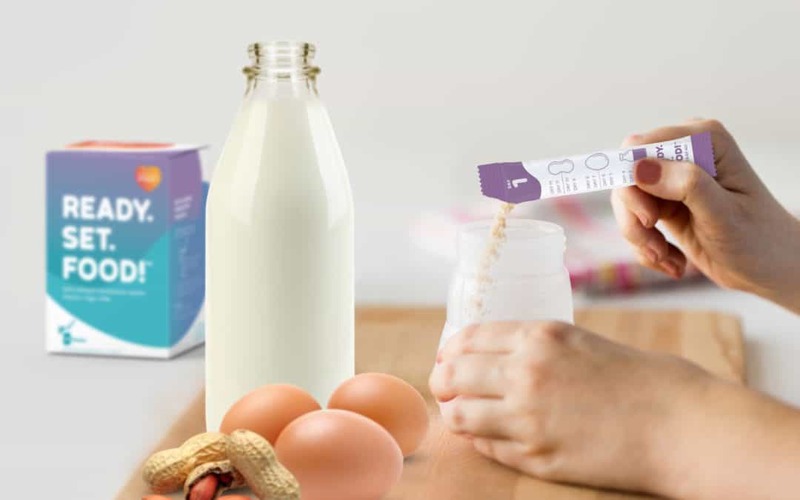 Can help reduce the risk of developing peanut, egg, and milk allergies by up to 80%. 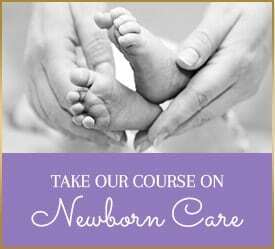 Is recommended by 200+ pediatricians and allergists. We’ve partnered with Educated Nannies to make allergen introduction even easier! Use the code EDUCATEDNANNIES20 to receive $20 off any Ready, Set, Food! subscription. 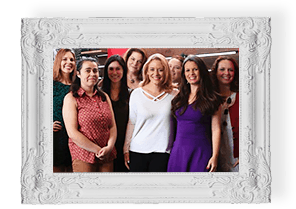 To learn more about Ready, Set, Food!, and to take advantage of this exclusive offer for the Educated Nannies community, visit their website here. About Katie Marks-Cogan, M.D. : Dr. Marks-Cogan is board certified in Allergy/Immunology and Internal Medicine, and treats both pediatric and adult patients. Originally from Cleveland, Ohio, she received her M.D. with honors from the University of Maryland School of Medicine. 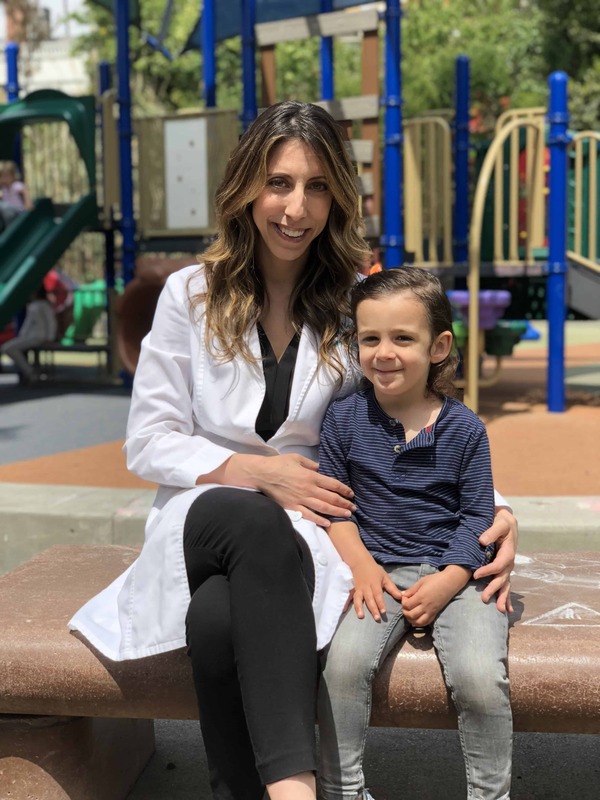 She then completed her residency in Internal Medicine at Northwestern and a fellowship in Allergy/Immunology at the prestigious University of Pennsylvania and Children’s Hospital of Pennsylvania (CHOP). After finishing training, she moved to Southern California and currently works in private practice. She is Chief Allergist for Ready, Set, Food! She currently resides in Los Angeles with her husband, 3 year old son, and 8 month old daughter where she enjoys hiking, building LEGO castles with her son, and cooking with her family. As one of the premier nanny referral agencies in greater Los Angeles and as parents ourselves, the safety and happiness of children is always our priority. On this nanny blog, we further our commitment to strengthening families by sharing resources and nanny articles we hope you’ll find helpful. We will also let you know when we’re having upcoming events, because we’d love to see you! Thanks for reading!